Some new time-saving Launch Center Pro actions. I made a couple of cool Launch Center Pro actions in the past week or so and thought they might be useful to others, so here they are. I make changes to my TextExpander snippets constantly on my MacBook, and while they sync via Dropbox, you still need to manually refresh apps that can take advantage of this feature if you’re not using the keyboard extension (I do a bit of both). I was always forgetting which apps can do this, so instead of keeping a list I had to refer to, I put them together here. Now I can tap once to launch TE, making sure the newest snippets are on the device, and then return to LCP, tap to go to the other apps and quickly make sure they’re all up to date too. It would be amazing if I could go right to the “refresh snippets” option in each app, but that’s just not possible, so this is as close as I can get. Pretty good, and saves me time and aggravation. I know you can subscribe to products on Amazon and have them delivered on a regular schedule, but there are plenty of things that we buy repeatedly, but not with a specific timeframe in mind. I used to go to the Amazon app, scroll through my orders, find the thing I wanted to re-buy, and add it to the cart. 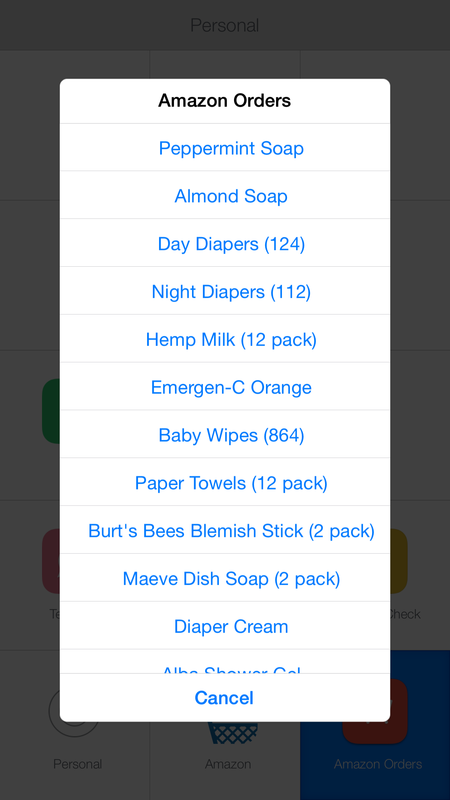 Now, I have a list of the things we re-order frequently, I can tap one, go to Safari (where I’m already logged in to Amazon) and add it in one tap. When I feel like closing out my cart, I can do it here or hop into the Amazon app itself to do so. It’s nice to have a list like this, and it’s very quick to get to the products we like. I love thinking of stuff like this that makes little chores easier. As I said in my previous post, I stopped using Todoist after a week, and it has nothing to do with the tool. I still think it’s totally amazing, and may absolutely go back to it. Which is the point of what’s to follow. Since transitioning from client work with Nickelfish to product work with Derby, the demands on my time are radically different. I no longer have dozens of meetings and calls a week, and my time is not double- and triple-booked. I can manage things in a very different way, and honestly, it’s been a very nice change. As a result, I’ve started to pay less attention to things in certain capacities. Since my calendar isn’t packed, I barely look at it. Which made me forget that my wife added a doctor’s appointment that I agreed to be present for earlier in the week (baby stuff, you know). Not a problem, as I remembered the day before and didn’t miss the appointment, but it brought an issue to light: I missed something. I’m not someone who likes to miss something. Similarly, my task list is different. I used to have multiple deliverables for many projects tied to me at any given time and I needed to manage my time in a super granular way. That’s not currently an issue for me, so I have lists of tasks I’d like to accomplish for my new projects that aren’t pressing, and hence aren’t always getting done. Which is not to say I’m not getting things done, I’m quite good at getting plenty done, but even with weekly reviews and my insistence on checking those lists, I’m usually focused on a “Today” view, which I’ve come to rely on. Fine in most cases, but I’m feeling like I could be doing more, because once “Today” is wrapped up, I’m celebrating and not necessarily looking for more to do. Prior to this week, I put everything I had into one system (OmniFocus, then Todoist). This included all personal and work responsibilities, recurring reminders, one-off items, anything. One place for everything. Nice. Except that since there was always something (i.e., some trivial recurring task) I felt like I wasn’t “accomplishing” because I could never clear those lists. While this may seem dumb to any person in their right mind, as we always have something we can be doing, it started to grate on me. Just a little, like a single grain of sand you feel after getting back from the beach and can’t quite find. So I’m burning it down. Zeroing out the dials. I’m going back to plain text. One file, all tasks, neatly written, and always in my face. Here are the specifics. A single .txt file (Todo.txt), in my dock, synced through Dropbox (duh), edited with TextEdit. It’s opened when I start my workday, updatable at any point, presenting all my tasks across my projects. Instead of a weekly review, I’m always reviewing, deciding what I can really do in the next few minutes, moving list items up and down, adding, deleting. No times, no dates, no contexts, just a few grouped lists. These are items that have no particular time component in terms of “due”, just stuff that needs to be done, by me, at some point. Anything that requires a time component gets a reminder in Reminders.app. All recurring items are here now, so they don’t clutter up my tasks. I have four lists right now: Bills, Repeating, Reminders (things due this week), and Future (things due after this week). I may add more, I may consolidate. Point is, they exist somewhere, but I don’t see them all the time, allowing me to focus on what I need to do. Since they exist alongside calendar items, I can now view these secondary items all together in Fantastical, so they’re visible but not prominent. An item in Todo.txt may have a partner reminder, but the point is it’s a reminder, the item still exists as a top-level task item in front of my eyes. 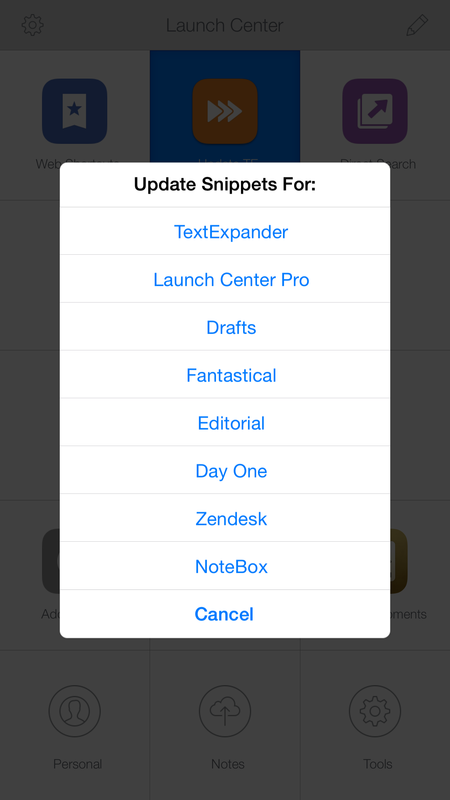 Naturally, with Launch Center Pro, Drafts, and any of the other dozens of apps I like to use, I can interact with this plain text file, appending, prepending (which I do as my “inbox” approximation, just throw things on top, and then move into appropriate lists), etc. It’s very fast, can be done in the background, and is accessible from anywhere, as is the case with my notes now. So: why the hell am I still doing this to myself? I thought about this last night and earlier this morning. As I said previously this isn’t about your typical productivity masturbation, or ‘this tool is better than that tool and here’s why’. This is about my brain, understanding how it works, and more importantly, coming to grips with the fact that my brain will work differently depending on a variety of ever-shifting factors in my life. I’ve written before about giving up and settling on a trusted system, but the more I think about it, the more I realize that my trusted system is me, and I need to allow myself the flexibility to use the right tool at the right time. I am not the kind of person who enjoys jumping from tool to tool instead of working and getting things done. But I’m no longer going to feel guilty about these explorations because I simply can’t fight it anymore. It’s evident to me now that it’s in my nature to change, as much as I’d like to think I’m stoic and able to calcify around something. I can’t think of anything less productive on a personal level than sticking with a system that isn’t working for you–for any reason. So for now, it’s this. Next week it might be something else. I won’t bore everyone with the details every time it changes, but I think I’m done apologizing to myself for feeling the way I have about it. And that makes me feel good.